Under certain circumstances, some employees need to return to the office after they’ve clocked out to complete some tasks. How do employer deal with this situation in Ingress & TCMS V3? Ingress & TCMS V3 can capture the last recorded time in the terminal instead of taking the first clock out time. This applies when you are using Weekly or Daily schedule. To set this, go to Attendance > Clocking Schedule > Range > Edit. 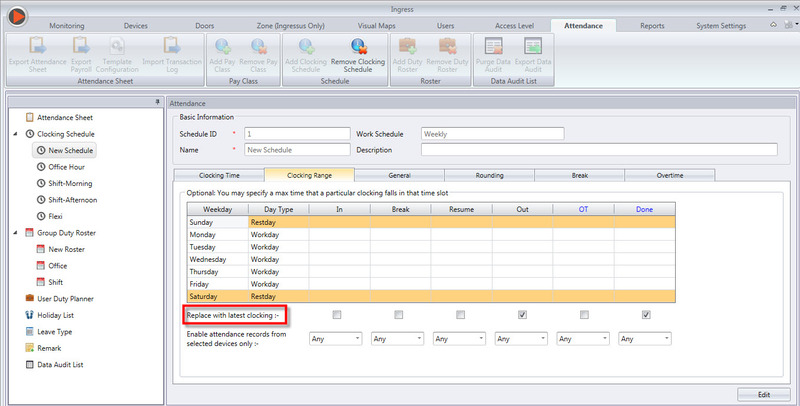 You will find “Replace with latest clocking” option below the Range table. The boxes are available at every range column and you can determine your own sets of attendance rules. However, it is highly recommended that you only check this for Out and Done column only. For example: The OUT time defined in the clocking schedule is 6:00pm and during the interval an employee checked out a few times at 6:15pm, 6:20pm and 6:50pm. If you have checked the box under the “Replace with latest clocking” for Out column, Ingress will select 6:50pm as the OUT record, leaving nothing missing in translation. hello i have bought one fingertech ta500 with v3 software, how to make the same if i thumb in tne machine check in is record check in, thumb check out is out?